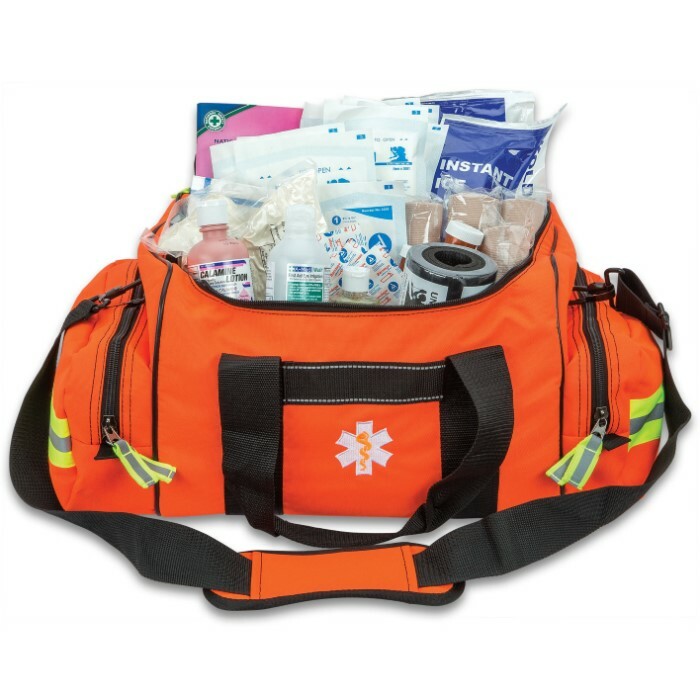 First Responder Bag - Spacious Compartments, Zippered Pockets, Complete Set Of First Aid Equipment, Shoulder Strap | BUDK.com - Knives & Swords At The Lowest Prices! 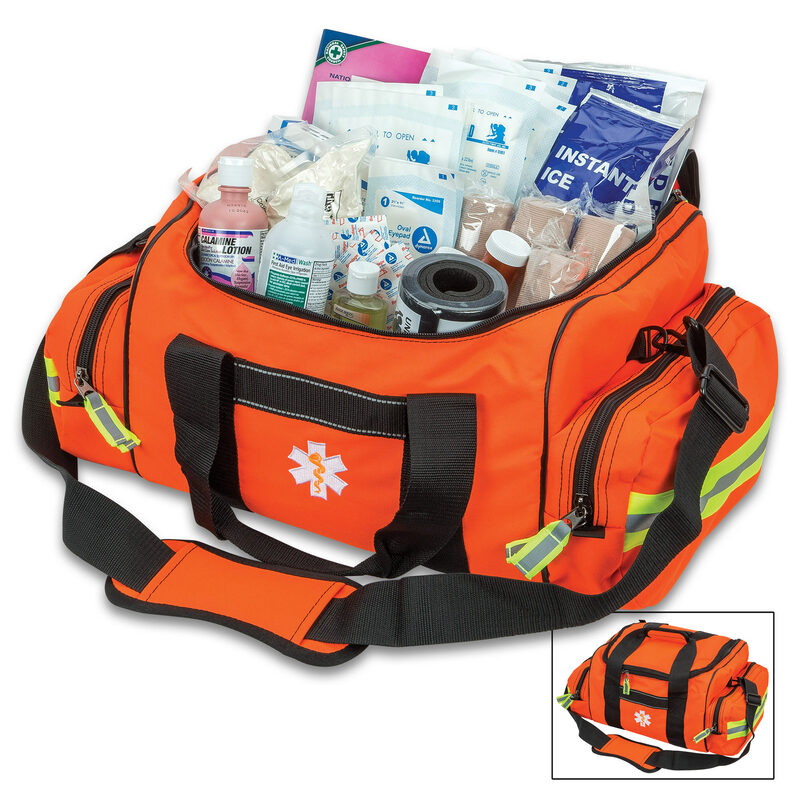 The First Responder Bag is a spacious bag with an extremely nice and thorough set of first aid equipment. 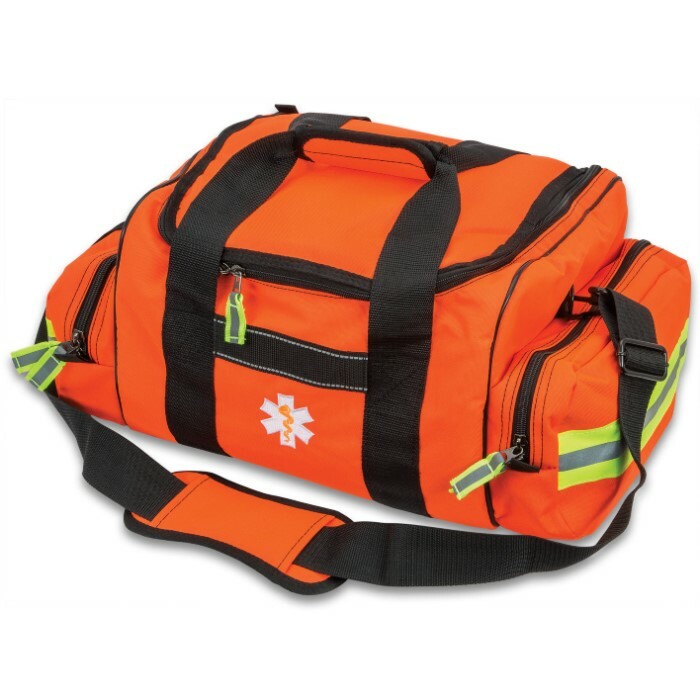 The sturdy bright orange bag has two zippered side pockets and a large main compartment. 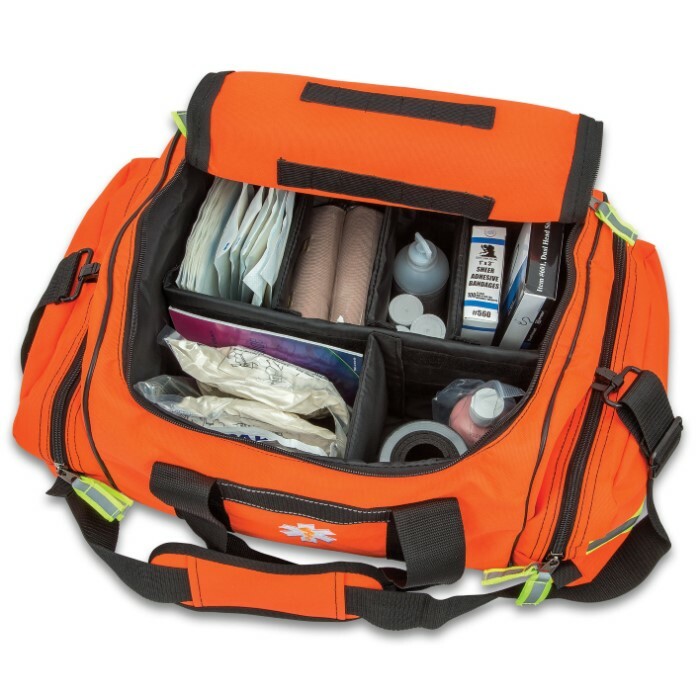 The bag can be carried by the strong nylon webbing carrying handles or the shoulder strap and is 15"x 12"x 8", weighing in at 9 3/4 lbs. The contents include a pen light, two sutures, a first aid book, two pill bottles, two pairs of examination gloves, six 5"x9" abdominal pads, 20 pain relievers/aspirin, two ammonia towelettes, a CPR mask, 100 cotton tip applicators, two first aid creams, two triple antibiotics, 2 Burn Aid packages, 3 rolls of 1" tape, 15 alcohol wipes, 15 iodine wipes, 15 antiseptic wipes, 15 clean wipes, six safety pins, an Airway, a skin and eye wash, a hand sanitizer bottle, hand soap, one 6 oz of Calamine lotion, petroleum jelly, a universal /Sam splint, two field dressings, three rolls of 4" bandage gauze, four 6" elastic bandages, 20 4"x4" sterile gauze squares, a Bleedstop bandage, two eye pads, a 40"x40"x56" triangular bandage, 100 1"x3" bandage strips, five butterfly strips, five 2"x4" bandage strips, five knuckle bandages, two ice packs, a stethoscope, two pairs of EMT shears, two stainless steel hemostats, a pair of tweezers, two tongue depressors, a #3 scalpel handle and two scalpel blades.